¶ 1 Leave a comment on paragraph 1 6 I have a good deal of interest in how members of the public who are not academically trained historians “do history.” For me, then, “public history” does not mean just projects, programs, and exhibits created by professional historians for the public, but rather the very broad and complex intersection of “the public” with historical practice. Provision those occupying this intersection with freely available digital tools and platforms, and things become interesting quickly. Because setting up a blog, wiki, or discussion forum means only a few mouse clicks, and archival resources are increasingly digitized, we are seeing a burgeoning of sites that coalesce communities around historical topics of interest. Even those who have no interest in setting up their own websites can participate in history-specific Yahoo! groups, multi-user blogging communities, and genealogy sites. ¶ 2 Leave a comment on paragraph 2 0 Such digital spaces expand and blur considerably the spectrum of what counts as historical practice. For example, on Ancestry.com, users piece together family histories by synthesizing government records and crowdsourced resources of varying origin and credibility. Professional historians might take an active interest, then, in how digital archival and communication resources affect the spread or containment of particular historical myths.1 It is not clear, however, how these technologies aid academic historians in participating, or impede them from intervening, in these discussions. This chapter uses discourses about black Confederate soldiers to explore how digital technologies are changing who researches and writes history—as well as what authorial roles scholars are playing in the fuzzy edges of historical practice where crowdsourcing and the lay public are creating new research resources and narratives. These digital tools and resources not only are democratizing historical practice, but also providing professional historians with new opportunities and modes for expanding historical literacy. ¶ 5 Leave a comment on paragraph 5 0 As we move through the four-year sesquicentennial of the Civil War, the term—its currency not yet graphable on Ngram because that tool does not search books published after 2000, nor websites—seems to be enjoying a resurgence. 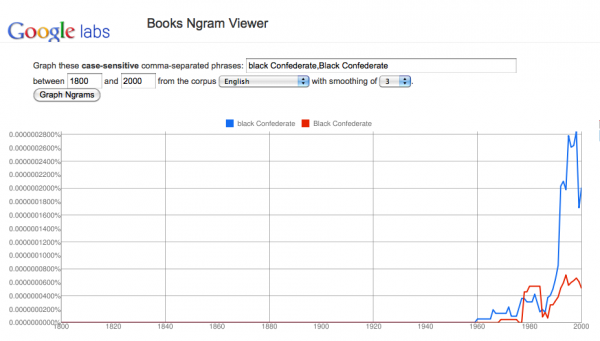 A Google search for the exact phrase “black Confederate” (inside quotation marks) turns up 102,000 matches. There are a number of cases of African American men being formally enrolled as cooks in the Confederate army and, so far as CSRs seem to indicate, formally enlisted as such. The researcher has been highlighting a number of these individual cases lately, always leaping straight from them to a universal assertion, this proves all Confederate cooks were considered soldiers. . . . I took 20 Confederate regiments more or less at random, and went through their rosters as listed in the CWSSS, and in those 20 regiments. . .found a total of FIVE men with records of formal enlistment as cooks. . . [C]learly the takeaway is that formal enlistment of cooks in the Confederate army was not only not common, it was exceedingly rare. ¶ 16 Leave a comment on paragraph 16 0 Here, Hall demonstrates an alternative, and ultimately more persuasive, reading of the document. He also illustrates how to place a source in a broader archival context. ¶ 20 Leave a comment on paragraph 20 3 At the blog Atrueconfederate, David Tatum blurs the line between cook and soldier, writing that a cook named William Dove appears on a muster roll that includes the term “enlisted” followed by a date.16 The digitization of wartime and postwar documents opens opportunities for more people to delve into the arcana of the past, but Tatum’s and DeWitt’s misinterpretations suggest one important role for historians at this cultural and digital moment is helping people gain the skills to interpret an era’s documents, photographs, and material culture. ¶ 21 Leave a comment on paragraph 21 0 Kevin Levin has provided the most extensive and substantive critiques of the black Confederate myth, including analyses of the major websites dedicated to the topic. 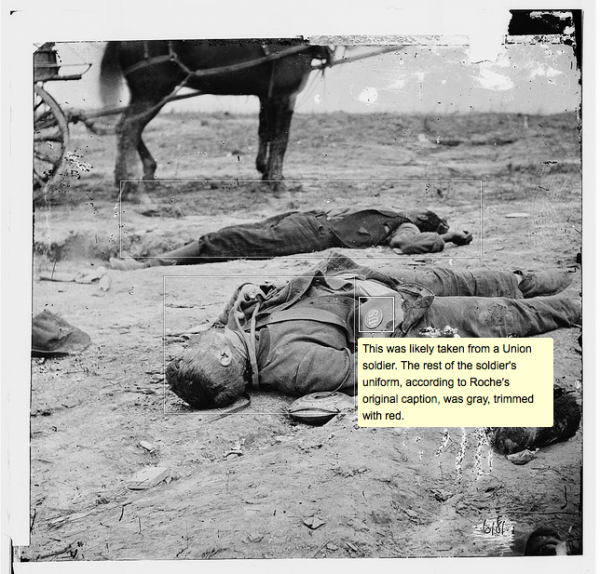 On his blog Civil War Memory, Levin carefully dissects the failures of Ann DeWitt’s Black Confederate Soldiers site to distinguish between soldiers and slaves on the front line. Levin highlights the site’s utter lack of realistic context for the experience of African Americans laboring on behalf of the Confederates. For example, DeWitt’s site assumes that parallels can be drawn between “body servants”—a term she uses to denote slaves who accompanied their owners into the field—and pink- or white-collar administrative employment today: “In 21st century vernacular the role is analogous to a position known as an executive assistant—a position today that requires a college Bachelors Degree or equivalent level experience.”17 Public audiences may find history more lively if they can draw parallels with their own era, but this particular comparison effaces the deprivations faced by slaves and wartime laborers. To be a historian at an institution of learning just means you have to show some papers that presumably verify that you’ve studied and learned. Most people so credentialed get their papers from institutes of higher learning, which as we know, have changed over the last fifty or sixty years from places of free thought and inquiry — a setting for acquiring knowledge — to centers of indoctrination. ¶ 30 Leave a comment on paragraph 30 0 This exchange raises three related questions, one of which lies at the heart of this volume: what constitutes real historical practice, how are digital research and publishing tools changing that practice, and what ought to be the role of professional historians in a space where authorship has been democratized? On the Internet, nobody knows you’re a dog25—and they can’t be sure, either, that you’re a credentialed historian. The most vocal opponents of the black Confederate soldier narrative in the digital realm are not employed by universities, museums, or other organizations as public historians. Corey Meyer teaches U.S. government; Kevin Levin was until earlier this year a high school teacher, and now bills himself as a “history educator” and “independent historian” who publishes in academic publications and has a book forthcoming from a university press; and Andy Hall does not disclose his profession.26 Brooks Simpson appears to be the only regular commenter employed as an historian outside of K-12 education. ¶ 33 Leave a comment on paragraph 33 1 My outlook on how the public “does history” online is less cataclysmic than Poe’s. I have seen enthusiasts produce interesting and useful historiography, and the ease of sharing digitized primary sources makes it easier than ever to determine the strength of the evidence presented in those narratives. Even when her historical narrative is on shaky factual ground, we can learn something useful about the writer’s—and possibly her audience’s—beliefs, habits, and values, which can also be useful to historians seeking to understand a specific public audience or contemporary cultural moment. That said, there is much at stake in the case of black Confederates, as the existence of black Confederate soldiers has been cited as proof the Civil War was not fought over slavery, but rather was pursued because of a regional disagreement about states’ rights. ¶ 36 Leave a comment on paragraph 36 4 The same digital resources that allow for the spread of the black Confederate soldier myth may provide for its containment. Deployed thoughtfully, digital technologies allow for online public historians—by which I mean, in this case, any credentialed historians who engage with the public—to focus on details that, were they merely in print, might seem abstruse or patronizingly didactic. The annotation feature on Flickr, for example, allows enthusiasts to highlight and comment on the smallest details of a photograph, asking or answering questions. “Black Confederate soldier” photos could provide a rich location for comprehensible, pixel-scale interpretation of much larger issues. Take Thomas Roche’s photo of the dead artilleryman and his own not-so-dead assistant; historians could unpack elements of the photo in ways that prove useful to students, and in many cases Civil War enthusiasts might recognize important details that escaped the historian. Similarly, audio annotation of visuals, as on VoiceThread, might provide both the lively polyvocality many netizens desire as well as a venue for the historian’s expertise, without descending into unbridled relativism. ¶ 37 Leave a comment on paragraph 37 0 Flickr’s annotation function could allow for nearly pixel-level analysis and discussion of Civil War photos. ¶ 41 Leave a comment on paragraph 41 0 As these examples make clear, digital technologies are allowing a broader spectrum of people to research the past and write about it for a large audience. Previously, one needed the time and money to travel to archives and, in some cases, the academic credentials to study particular primary source documents. Once the research had been transformed into an article or book, there were usually gatekeepers—publishing houses, editors, and peer reviewers—to ensure some level of academic rigor. As historians, more of us need to explore new roles in the digital realm, assuming whatever responsibilities appeal to us as individuals. For some, this might mean starting a blog or podcast on an area of research; for others, it might mean publishing an ebook on how to interpret primary sources from a particular era and geographic region. Others will relish a more assertive, or even combative, role as debunkers of myths on forums or Wikipedia. ¶ 43 Leave a comment on paragraph 43 0 About the author: Leslie Madsen-Brooks is an assistant professor of history at Boise State University. The democratizing nature of the Web is not a new topic in the realm of digital humanities. What is given less attention is how this democratization changes the way history is produced and disseminated in the public realm. Leslie Madsen-Brooks is particularly interested in the way the Internet allows a non-academically trained public to “do history,” and the relative absence of professional historians in this growing online dialogue. To illustrate her arguments, she uses the propagation of the black Confederate soldier myth in online forums like blogs, websites, and discussion boards. One of the questions raised in this article is similar to those presented in connection with the existence of Wikipedia: what do we, as professional historians, do about the “bad” or unsubstantiated histories that are made widely available due to the “rise of inexpensive and easy-to-use digital tools?” (¶9) In an age where almost anyone can publish in an online space, do historians have a duty to engage with this content? While not going so far as to label it a mandatory obligation, Madsen-Brooks insists that “an important role for historians . . . is helping people [members of the public] gain the skills to interpret an era’s documents, photographs, and material culture” (¶20). While this is a pleasant thought, one has to wonder what kind of historian has time to police the web in such a fashion? Madsen-Brooks is not ignorant of this problem, and provides excerpts from the conversation as it has appeared in academic circles. Most telling—and representative of the reasoning nearly all academics cite—is Marshall Poe’s explanation that a digital presence “doesn’t really count toward hiring, tenure, and promotion.” But by staying absent from these online conversations, historians are leaving the writing of history to public users who are “uncritical, poorly informed, and with axes to grind” (¶32). Despite the seriousness of this issue and its implications for the future of history on the web, Madsen-Brooks does not offer any suggestions as to how to improve the situation. In her defense, it is not a matter which is easily resolved. How can we make sure that Internet presence is considered as part of tenure? “Sustaining Digital History,” a meeting held at the University of Nebraska-Lincoln last fall, attempted to address these issues by gathering authors, peer reviewers, and journal editors together to discuss the ways in which digital scholarship might be incorporated into the existing print-based journal world. While not directly related to the issues undertaken in this article, it is indicative of developments that are taking place to raise awareness of digital forms of scholarship. More of these dialogues need to happen in order for institutions to understand the value of scholarly work in the online environment. The problem facing us at the moment is that creating a “digital footprint” takes time away from professional pursuits. Until creating digital scholarship, composing historically-driven blog entries, or participating in online historical debates counts as part of those professional endeavors, I think the trend of few professional historians on the web will continue. But back to Madsen-Brooks’ assertion that historians should be actively-participating with the Internet audience, she suggests the need for “online public historians”—“credentialed historians who engage with the public” (¶36). While I do not think she intended it this way, this comment triggered in my imagination a new brand of historians. Most of the discussion about digital history centers on University academics. But what about historians who work outside the academy? As an historian who plans to work in the public realm, I wonder if we might not consider this part of our relations with and education of the public? If educating or interacting with the Internet audience is not a job for academic historians, is there room for a new kind of public historian? Putting these questions of time and tenure aside, how can historians participate online? Madsen-Brooks urges more historians to “explore new roles in the digital realm” by assuming “whatever responsibilities appeal to us as individuals” (¶41). She suggests opening a blog or podcast, creating an e-Book, or managing content on public forums like Wikipedia. But is joining already-established networks the best way to go about this? Joining the blogosphere will only result in historians creating works that look like the “amateur” publications. What is lacking here is a sense of legitimacy, an elevation of the work of academics with “a background understanding of how to work with [historical] items” over that of a non-credentialed public (¶28). Perhaps we need more “born-digital, open-review” venues such as “Writing History in the Digital Age.” Or perhaps an academic blogging platform that requires registration or credentials to participate. There appears to be no definitive answer to the questions posed in this article. However, Madsen-Brooks’ thoughtful presentation of the complications that arise with the democratization of the Web are an important addition to the conversations that will eventually lead to a new role for historians in the digital age. Leslie Madsen-Brooks’ essay, “I nevertheless am a historian,” is an excellent way to start, framing central questions for the collection in the context of a broadly accessible and hotly contested test case. Her themes (“what constitutes real historical practice, how are digital research and publishing tools changing that practice, and what ought to be the role of professional historians in a space where authorship has been democratized?”) are key to the collection as a whole. As a non-historian, though, I was left with some puzzlement about what seemed to be under-interrogated references to “academic credentials.” What constitutes a “credentialed” historian? Does this require a doctorate? Are there alternative routes to recognized/recognizable authority? Would public historians and museum workers with master’s degrees or significant work experience be considered adequately credentialed to adopt the “guide on the side” role Madsen-Brooks advocates — or would these people remain in the group of “other professionals” with whom those addressed in her last paragraph might collaborate? I suspect the central points of this excellent essay would not only be strengthened but made more applicable to disciplines outside or on the edges of history, if some of the field’s internalized assumptions about credentialing were addressed head-on. This essay tackles an exceedingly interesting question for historians–when and how might they intervene in the digital environment over questions of authenticity, authority, and/or interpretation. The black Confederate movement develop in tandem with the Internet. In 2000 when Alice E. Carter and I published The Civil War on the Web, a critical guide to the way the Civil War was portrayed on the web, we received almost immediately a flurry of challenges from a group of re-enactors in Terrell’s Texas Cavalry brigade because we had not included their site among our 100. The site, it turned out, featured documents purporting to provide evidence of so-called black Confederates. Most of the documents were from the Official Records and, in their original context, referred to impressed Confederate laborers. The members of this organization began sending me emails, however, suggesting it was liberal academic bias not to see what they saw in these documents–what they called a “rainbow coalition” of the South’s independence hungry soldiers and cause. They claimed then that academics were suppressing the real story of the war. One email was signed by a falsified name of an alleged emeritus professor of history at Yeshiva University–no such person was ever employed at the school. In any case the group moved on as I recall and their attention became focused on defending John Ashcroft. The point is that digital information can be manipulated and identities concealed in the online space. I found little reasoned discourse in my private email correspondence with the fellows of Terrell’s brigade. There was a veneer of initial courtesy and over the course of this correspondence a rapid escalation into accusation and diatribe. So, I’m skeptical based on this experience of Leslie Madsen-Brooks’ suggestion that we participate more and become the “guide on the side.” (Kevin Levin was a student of mine in a teacher’s seminar at the University of Virginia, and he has done more work on this issue than anyone. His suggestion makes a great deal of sense to work on the broader questions before the public.) One of the reasons that this issue has some bearing is that the largely white American narrative of the Civil War elides the contributions of African Americans, or the experience of African Americans. I would ask her to press more on the question of how to deal with the question of rip-mix-burn culture and the provenance of, and interpretation of, historical materials. The online space excels at manipulation. Are historians working against the grain, the underlying nature of the medium? If so, what can be done to take more advantage of the medium to give greater context to this subject–see for example the Virginia Historical Society runaway slave role playing exhibit–fully immersive. There are a variety of places to tackle this point (both in this essay and throughout the project) but I would like to see a more extensive awareness of the larger and prior domains within which this approach to digitization and the circulation of historical knowledge sits. Meaning, Madsen-Brooks in this first paragraph mentions this wider sense of the “production of history” but then quickly confines it to digital practices and media. I think it’s fine for this essay (and the wider project) to have that focus but the question of how historical knowledge circulates and is produced by publics and individuals beyond the academic guild of historians is a question that precedes the digital–Michel-Rolph Trouillot, Raphael Samuel, David William Cohen, John Gillis, Joanne Rappaport and many others come to mind quickly in this context. I think the contributors need to do this kind of situating early in their analyses in order to sharpen the sense of what digitization changes (or does not change) about the production of history in circulations beyond and intersecting with the academy. Thanks so much for your comment, Bethany. I absolutely used shorthand where I should be more forthcoming, and I recognize some irony in encouraging non-credentialed historians to tackle history at the same time as I insist on some kind of credentialing. The recent discussion of badges comes to mind. . . Thanks again! Thanks so much for your insightful and thorough comments, Kaci. I wish I did have an answer to the question of how to differentiate “credentialed” (an adjective I realize I’ve left pretty vague here) historians’ work online from amateur historians’ contributions. My own department’s guidelines for tenure and promotion do recognize “alternative” contributions to traditional scholarship, but what exactly constitutes significant and relevant production is evaluated case-by-case; there aren’t clear delineations between what counts and what doesn’t. As an assistant professor on the tenure track, I’d love to see some clearer advice on such matters emerge from our professional associations. Because I mentor many public history grad students, I’d also like to see more discussion (beyond talk of “Plan A” vs. “Plan B”) about how to prepare these emerging professionals for a digital age. How much of their training should include technological literacy and skills, and how much of it critical thinking about the public use of technology to “do history”? Thank you, William, for sharing your own experiences with the Black Confederate soldier proponents. Perhaps I am being too generous in suggesting we work with them rather than always be in combat against them, and maybe I could have selected a better example to demonstrate a place where professional historians could enrich the understanding of amateurs pursuing reasonable historical leads. Mainstream genealogy comes to mind as one place where historians might serve as guides on the side. That said, at a recent regional history conference, it became clear to me that many genealogists would see such offers of assistance as intrusive, as they are the experts in their domain. That discussion has made it more difficult for me to imagine spaces where such collaboration could occur. Perhaps citizen science offers one model? You’re absolutely right–this essay does need greater contextualization. In part, my own scholarly myopia explains the omission. I did become a scholar in the digital age, and I don’t have any degrees in history myself–mine are in English and cultural studies–which means I also don’t have the historiographical background that might ease such a contextualization. Another issue in this elision is we are limited to 5,000 words, and I have to admit in my own revisions, I prioritized Black Confederate examples over context. When I revise the essay, I’ll look for ways to provide some sense of the conversation about knowledge circulation and democratization prior to the digital age. Thanks so much for your comments. Thanks to everyone for your comments. As a veteran of creative writing workshops, I’ve been sitting back and “listening” to your contributions rather than engaging with them all along (as I fear I would sound–or be–defensive), but please know that I’ve been finding them incredibly helpful and insightful. I think it would be great to have some further explicit discussion of ontological and epistemological issues within the essay. It might be interesting for there to be some dialogue between you and Wolff (especially paragraph 5) regarding how we perceived memory and history. See also other comments on your essay in the Fall 2011 web-book. Please do your best to incorporate these recommendations into your revised essay. According to the word count at the bottom of the WordPress editing window, your current essay is 4,844 words. In order to meet our obligations to the Press, your final resubmission must not exceed 5,000 words. As a history major in college, I admit that I don’t know a third as much as any regular historian, but I have done research on African American Confederates. I’m also a Civil War reenactor, so it’s quite a controversial issue. While there were definitely more black Union soldiers, it seems to me that there were at least some instances in which African Americans fought as soldiers in the Confederate military. To deny this would be to discredit vast numbers of period quotations and journal entries and newspaper articles regarding the matter. While there weren’t 1000s of black Confederates, there were a number. To deny this would be revisionist. Is “Yahoo! groups” the best example for this? Facebook? The central question of this essay is provocative and important – how can the public participate in the making of history. This question reminded me of the work Jacqueline Goldsby of the University of Chicago’s is doing with “Mapping the Stacks,” http://mts.lib.uchicago.edu/. The project trains graduate students in the process of making archives accessible but also draws on local knowledge of the Chicago public to aid in the understanding of Chicago history. Good point. The Yahoo! groups reference does seem dated. Facebook would be a better example. I was unfamiliar with this intriguing project. Thanks so much for your comment, and for introducing me to Mapping the Stacks. Absolutely. I wanted to include a wider-ranging analysis of who has the privilege to participate in these online discussions, but space limitations are keeping me from providing the kind of context I’d prefer. Still, I’ll try to find ways to better define “public” and delineate which tools are accessible to participants on a broader socioeconomic spectrum. Recte, “the twenty-first century footprint”? I think this paragraph raises sharper questions than the essay currently considers. We leap from this point into discourses operating within digital media, primarily blogs. A lot of the analyses which follows is great (for example, dealing with the effect digital media have on the speed of and feedback loops in discourse between participants) but there is a key historiographical question here that I think gets collapsed into a relatively simple moment of digitization. If it’s true that the discourse of “black Confederates” substantially precedes digital discourses, I think there’s a moment of articulation between pre-digital conversations in spaces of “amateur” or “activist” historical production and digital ones–that articulation is sociological, it’s about media forms, etc. To the extent that it’s possible I’d love to see more detailed attention to the articulation between productions of “black Confederate advocacy” in pre-digital memorializations of the South, the Civil War and the take-up of those productions in digital spaces. Excellent suggestion. I suppose I need to spend some time on archive.org to find the earliest available exchanges about Black Confederates at that moment of articulation. Do you have other suggestions on where I might look for these discussions? What do you consider to be a significant number? And what exactly is the “myth?” A significant number or any number? Consider citing “Royal Diadem’s” real name on first mention, paragraph 11 above. Taken in the context of your wider discussion, this is a critical and interesting point about the role of the historian. It links to ideas of historian as a guardian of the past. In my mind it invites consideration of the underpinning ontological and epistemological issues regarding whether the past exists in some objective sense or is imagined. Charlotte, you’re right. The paragraph does invite that kind of consideration. I’m worried that in the space available to me here (5,000 words), I might not have the opportunity to play with the philosophical implications of an imagined or actual past. Still, if I have the opportunity to address this topic in a longer form, I absolutely will pursue that line of investigation. Many thanks! One of the complicating questions to ask at this juncture is, “How is this different from the idealized ‘normal’ view of how historical scholarship should be produced?”. E.g., peer review is in theory used within scholarship in a roughly similar way: a scholar interprets a document, another scholar looks at the document and checks the interpretation, sometimes finding that a document has been misinterpreted, or that the authenticity or provenance of the document is in doubt. In a way, the only distinction we can draw is either that the propensity of “black Confederate advocates” to misinterpret documents is far higher than professionally trained historians, which just reproduces the gap between engaged publics or amateurs on one hand and academic historians on the other, or that these misinterpretations are distinguished largely by their ideological or political motivations. At which point the critique of craft is substantially an entry point to a larger critique–which in turn is the issue engaged in the next section of the essay. It would be interesting to further explore the difference between history and memory. Some consider that “history is collective memory… through which people develop a sense of their social identity and their future prospects” (Tosh, J 1991, The Pursuit of History, Longman, p.1). It might also be worth extending your argument under the reflection that people’s reflexivity can be an important source of co-ordinated collective action (Baert, P. and Silva, F.C. 1998 Social Theory in the Twentieth Century). “gentlemen do for a living is…is teach” – ‘is’ repetition, though maybe you’re using the double is to invoke something of Connie Ward’s indignation, I’m not sure. I also teach 4 sections of American History, 1 section of Current Events and Earth Science. Thanks so much for the clarification, Corey. Current Events and Earth Science? Wow! Having reached the end of the essay, I’m not sure that Poe’s position has been convincingly rebutted. The evidence presented here does show that “crowds” are capable of self-correction (e.g., paragraph 38) — that they can to some extent regulate outbreaks of “bad” history — but I’m not sure that’s the same thing as creating “good” history. It may be helpful for this essay to lay out more precise definitions of the kinds of historical work “crowds” / “users” / “amateur historians” are doing on the discursive battlefield of the Black Confederate Myth. They may not be the same definitions of historical work that Marshall Poe is (or other skeptics are) using. In an essay below, Amanda Seligman focuses on “tertiary sources,” such as encyclopedias, and this essay might benefit from more clarity about the tertiary / secondary distinction. The case of the BCM may show that “self-regulating” communities of non-academic historians can produce, or at least preserve, defensible “tertiary” sources (overviews of existing knowledge). But when it comes to “secondary” material — interpretations (or mis-interpretations) of historical evidence — the same case study seems to show that, at least in terms of sheer volume, “the crowd” history is producing more myth than corrective. If the crowds are not wise, perhaps that’s the argument right there for why volumes such as this, and the kind of engagement discussed in this essay, must be part of a ‘formal’ historian’s daily practice. … which is of course the point of Poe’s article. Excellent point, Christopher. My essay does blur the definitions of crowds, users, and amateur historians. I like your distinction between secondary and tertiary material; I hadn’t considered the Black Confederate myth in that light, since I was so caught up with the proponents’ use and misuse of primary sources. I agree, Mike. I have had a couple colleagues quietly suggest to me that, at least for a public historian on the tenure track, significant blog posts (or series of posts) that stimulate discussion ought to be considered at least as valuable as traditional essays published in minor journals where the articles are read by maybe half a dozen people. I am interested to see what kind of reception my contributions to Writing History in the Digital Age get in my tenure dossier in a few years. This makes me reflect further on whether memory is social and the place of public myth. Here it might be interesting to give further consideration to the work of Fentress and Wickham who recognise the social role of memory, “one mak[ing] individual memory ‘social’… by talking about it” (Fentress and Wickham 1992, 201; ix-x). They suggest that consciousness is mediated through memory and society cannot be reproduced without exercising memory (Fentress and Wickham 1992, 201). It might also be interesting to consider what these examples of inaccurate history can tell us about the thoughts, beliefs and desires of the groups and communities which share them. Allen and Montell (1981) suggest that even factually unreliable accounts can demonstrate how a community feels about an an issue and the meanings of a tradition (Allen and Montell 1981). It may be seen that memory “tells us who we are, embedding our present selves in our pasts” (Fentress and Wickham 1992, 201). To an extent this seems to be tackling what people want to hear and believe. I’ve been considering ‘Filter Bubbles’ lately as discussed by Eli Pariser in this TED talk. [This also relates closely to Graham’s paragraphs in this collection regarding Google +.] I would be interested to consider what your thoughts are of these developments in relation to histories such as ‘the black Confederate soldier narrative’. What are the implications for those with differing viewpoints to be aware of each other? I find the opening sentence here less encouraging than it seems intended to be. If wildfires were so ravaging a place that construction workers had to be redeployed as firefighters, we might be grateful that all of them had good firefighting equipment, but we still would regard the larger situation as one of devastation and loss. Given that historians and their time aren’t infinite, doesn’t it stand to reason that every hour spent using digital resources to “contain” pernicious myths is an hour not spent using those resources to deepen knowledge and understanding? “Containment” is such a loaded term here, too — beyond the previous commenter’s concern about whether this activity interferes with historians’ productivity, is “containing” what we really want to see with Internet discourse of any kind? Or is the goal here better contextualization and promotion of digital and historical literacy? I’d be interested to see more elaboration on your definition of ‘online public historians’ – for example what credentials would count? In the paragraph above it seems that credentials in history based on memorising content might not be those seen to be needed to encourage an appreciation of context. I found myself thinking here about the multiplicity of digital spaces–how, for example, the work of history emerges on a political/journalism blog (Ta-Nehisi Coates) in different ways, perhaps, than on blogs or fora devoted to the issue. Just a pedantic stylistic issue — since the essay begins and ends with it so strongly. “A” or “an” historian? I realize that one is a direct quotation and the other may be the author’s (in my opinion, correct!) preference — but to prevent distraction (and perhaps for copy-editing consistency throughout the book) one or another might be stuck to. The term ‘lay public’ remains undefined; although you address arguments which point to disagreement on what constitutes a historian, it is rather implicit. Maybe you’ve chosen for the audience to grapple with it in their own head, but I think it could be further addressed earlier on in the essay, if only with a working definition. Similarly it might be good to include something creating a working framework or introductory discussion making distinctions between these different groups – lay public, amateur historians, other professionals. Also maybe put ‘academic professionals’ rather than simply ‘professionals’. I’m not sure. Coates’ blog and its community of commenters would indeed make an interesting case study, especially since it appears many of his commenters sit on the opposite end of the educational and ideological spectrum from Black Confederate proponents. Thanks, Charlotte. Clearly I need to better define my terms throughout the essay! I think these concerns about affecting (and generating) our own data, and the paper’s overall methodology are perhaps important enough to be promoted to main text? I grant that this would perhaps decrease readability but to the academic reader it may not be less interesting than the main content, especially since it is somewhat in tension with some of the suggested interventions in the essay’s final paragraph. Jonathan, this is something I wrestled with as well. In several drafts I promoted this consideration of ethics to the main text. I’m still wavering about it. . .